Soup – who doesn’t love a good bowl of the hot stuff? It’s a lunchtime favourite for city workers and your restaurant has a reputation for producing the best, right? 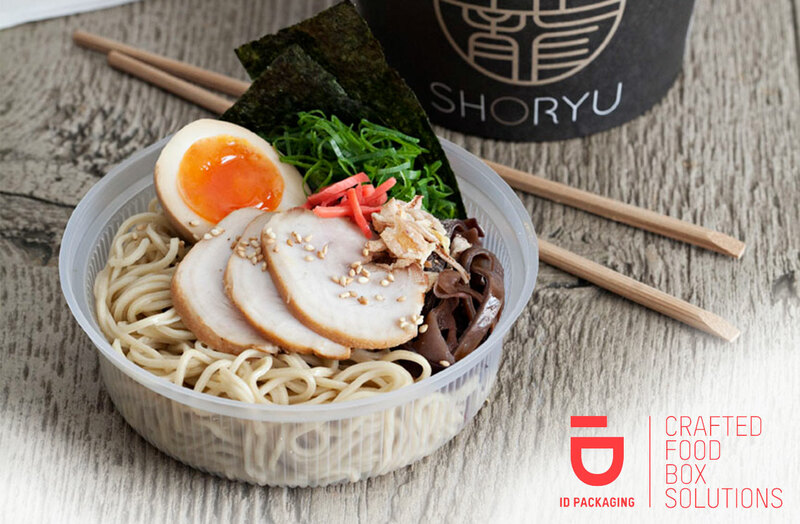 When customers are pounding the streets during lunch hour with a bowl of your finest Ramen or Rice Noodle Soup, passersby are going to catch a whiff and want their own so branding your containers is essential. People need to know where they can get their own phenomenal Pho and your bowls are going to tell them. At ID Packaging we’re soup bowl experts – a bold claim, but one we’re happy to back. Soup comes in all shapes and sizes so your packaging should too. To keep your flavours as fresh as the minute they were created our bowls feature 16oz and 20oz inner trays. That’s is the practical bit – no one wants steaming soup running onto their work-gear – but creativity is our middle name so the outer packaging is a blank canvas for you to brand until your heart’s content. In 36oz and 42oz sizes, outer bowls are custom printed to order with food-safe dyes stamping out your logo or key messages for the world to see. Better still, we use recyclable materials so you can tell your customers their carbon footprint is lessening with every mouthful. Bowls aren’t just for soup remember. Think outside the box and consider using them for your saucy goods (um…sorry, couldn’t resist!) like chicken tikka masala, duck red curry or beef in black bean sauce. You can use our bowl combos to carry the accompaniments too – no one wants a tikka masala without a side of pilau so make use of the bowl and tray insert combination to get both parts of the order out at once. We’re aware that you might be new to branching out into bowls so there’s no pressure to take a landslide order on board. 12,000 units is our exclusive minimum order count giving you the flexibility to only take what you need when you need it. We offer free storage for up to three months too, so you’re not going to have to fight your way through stacks of packaging to get to the stove. You won’t be the first to reap the benefits of working with ID Packaging either – with Bang Bang Vietnamese Canteen using our custom prints and Bone Daddy going for a handmade effect to truly show their authentic colours, you’ll be in good company.